The Exclusive Option Leather Steering Column Surround is located directly under the instrument gauges and features contrasting stitching sewn around the column opening and is complemented by a rich leather surface. TThis Leather part that sits recessed in the dash is a very rare option on the 996/986 models, but come standard on highly optioned Turbos. 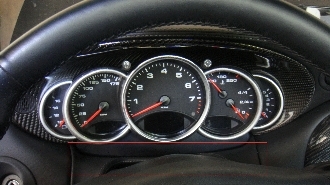 This noticeable part adds an exclusive look to dash of your 911. Replacing the plastic with leather giving your Porsche a distinctive, high quality look. Steering Wheel does NOT have to be removed for installation.